DFAB HOUSE has officially opened today on the NEST building of Empa and Eawag in Dübendorf. It is the world's first inhabited "house" that was not only digitally planned, but also – with the help of robots and 3D printers – built largely digitally. The construction technologies were developed by ETH Zurich researchers in collaboration with industrial partners. A delicate concrete ceiling – cast in 3D-printed formwork – and a curved concrete wall created by a construction robot characterize the architecture of the living room, whose aesthetics are remotely reminiscent of the film sets of the Swiss artist HR Giger (the creator of "Alien"). Upon saying a specific command, the blinds open as if by magic and the kettle prepares water for tea. What sounds like a science fiction film is reality in Dübendorf: today, the smart and largely digitally planned and built DFAB HOUSE opens its doors. The three-story "house" is located on the uppermost of three platforms at NEST. 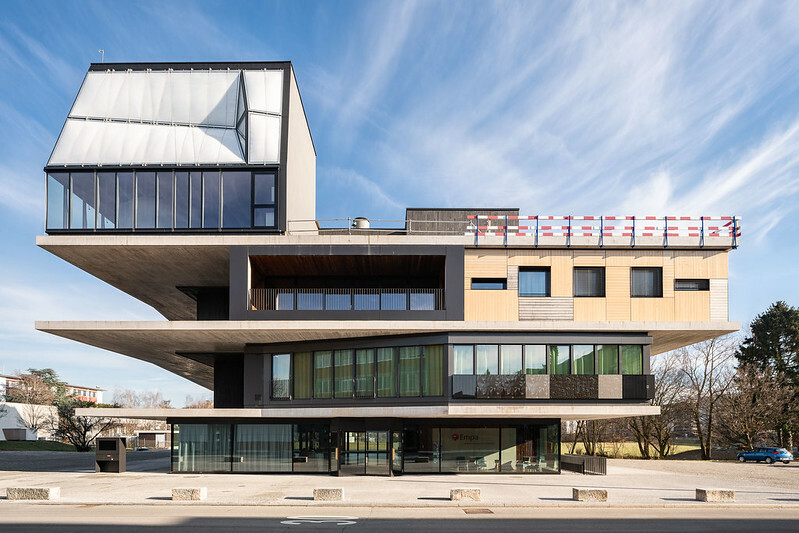 On this modular research and innovation building of Empa and Eawag, researchers, together with industrial partners, can test new construction and energy technologies under real-life conditions. NEST consists of a central building core, to which various building modules – so-called units – can dock. For the construction of the DFAB HOUSE unit, researchers from eight professorships at ETH Zurich, within the framework of the National Center of Competence in Research (NCCR) "Digital Fabrication", in collaboration with industrial partners, have for the first time transferred several novel digital construction technologies from the laboratory into real-world applications (see Factsheet Digital Fabrication). The aim of digital technologies is not only to make planning and construction more efficient, but also more sustainable. For example, the digitally planned floor slab of DFAB HOUSE is statically and structurally optimized in such a way that considerable amounts of material can be saved compared to a conventional concrete slab. The technologies also open up new design possibilities. For instance, the two upper residential floors are characterized by wooden frames, which were fabricated with the help of two construction robots and arranged in complex geometries. "The architectural potential of digital fabrication technologies is immense. Unfortunately, these technologies are still scarcely used on construction sites. With the DFAB HOUSE, we are able to test new technologies hand in hand with industry and thus accelerate the transfer from research to practice," says Matthias Kohler, ETH Professor of Architecture and Digital Fabrication. In around two months' time, the first residents, academic guests from Empa and Eawag, will move into DFAB HOUSE. At DFAB HOUSE, they will live in an intelligent home. A consortium of companies led by digitalSTROM has installed the first smart home solutions in DFAB HOUSE (see Factsheet Digital Living), which are based on the manufacturer-independent digitalSTROM platform. These include intelligent, multi-stage burglar protection, automated glare and shading options, and the latest generation of networked, intelligent household appliances. However, DFAB HOUSE is smart not only in terms of home electronics, but also in terms of energy management: Photovoltaic modules on the roof supply on average one and a half times as much electricity as the unit itself will consume, while an intelligent control system coordinates all consumption and ensures that no load peaks occur. Two start-up ideas, accompanied by researchers from Empa and Eawag, are helping to save additional energy: On the one hand, heat from waste water, which would otherwise be lost, is recovered directly in the shower trays via heat exchangers, and on the other hand hot water flows from the pipes back into the boiler when not in use instead of cooling in the water pipes. This method not only saves energy and water, but also reduces the risk of bacteria growing in the pipes. Can the properties of composite materials be predicted? Empa scientists have mastered this feat and thus can help achieve research objectives faster. This leads, for instance, to better recycling techniques and electrically conductive synthetic materials for the solar industry. Empa CEO Gian-Luca Bona on the opportunities and risks of digitalization – and the question as to how a materials research institute needs to gear itself up for this future. More. Can you cool with waste heat? Sure. A Swiss research project involving Empa, which ended in November, demonstrated this in an impressive way. Now a large-scale EU project is starting: industrial cooling – thanks to the Spanish sun. More.